I&apos;ve been seeing a lot of deals for all-inclusive resorts this summer, and it makes sense—when you&apos;re pinching pennies, it&apos;s great to know your price for everything (accommodations, meals, and entertainment) up front, with no surprises later. All-inclusive properties also offer the ultimate in relaxation—everything is provided for you—which may be especially attractive in these high-stress times. 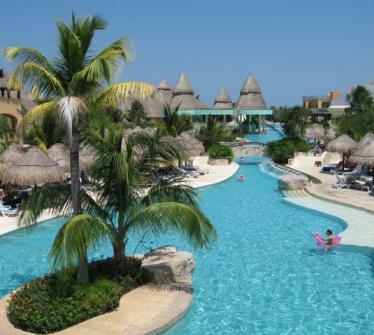 Vacation Outlet maintains a site exclusively for promotions at all-inclusive properties. At press time, current deals covering airfare, all-inclusive hotel, and taxes included $665 per person for four nights at the Starfish Trelawny in Falmouth, Jamaica; $779 per person for four nights at Dreams Punta Cana in the Dominican Republic; and $849 at Breezes Bahamas in Nassau. Many other packages are available; check the Vacation Outlet website for the latest offerings. You&apos;ll also be able to find a variety of all-inclusive vacations on sale at BeachDestinations.com, CheapCaribbean.com, and PleasantHolidays.com. CheapCaribbean offers a feature where you can search by meal plan (select "All Inclusive" from the drop-down menu); other providers simply note which properties are all-inclusive in their search results. Popular all-inclusive brands such as Beaches, Club Med, and Sandals list the latest promotions right on their own websites. Booking directly with a provider also eliminates third-party fees. So,how many of you will be using the all-inclusive option this summer? It sounds like a great way to get it all, including these beautiful Tampa Bay area beaches, Tampa Bay dining and so much more! Keep checking back as we bring you more travel trends for Summer 2009 over the next few days. And keep checking back for great ways to implement these trends and updates about great things to do in Tampa Bay!